Note from the Editors: This is the first of an on-going series of articles discussing what we are watching and why it keeps us interested. There is so much on television and streaming outlets it may be hard to watch everything so if you happen to miss something or are trying to get a sense of what someone thinks about a particular show look here for an article or the FoCC forum for a discussion. We are open to hearing from readers and guest contributors for this topic and encourage anyone interested in sharing why they enjoy a particular show. This will be a spoiler-lite zone so our hope is to give you, the reader, a taste of what makes the show interesting while not ruining the viewing experience. 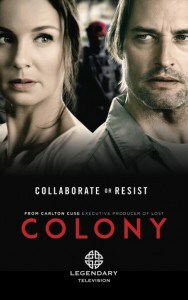 The first article for “What I am watching” is Colony. 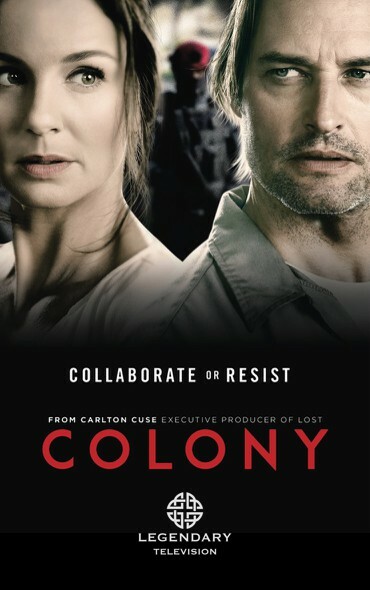 This is a sci-fi based show which airs Thursday nights on USA network and stars Josh Holloway (Lost) and Sarah Wayne Callies (The Walking Dead) as Will & Katie Bowman. The show that is set in the near future where Earth is occupied by an alien race, referred to as The Hosts. The arrival of the aliens left mass destruction in its wake and in the aftermath ‘zones’ enclosed by massive walls for humans to live under strict oppressive rule. Taking place almost a year after the arrival this show centers on the Bowman family living the Los Angeles zone. They seem normal at first but you soon learn that they are a fractured family because one of their children is missing, Charlie, who was separated from the family during the arrival of the aliens. The Bowmans do not know the fate of their son so this is a motivating factor for them to do what they can to survive and get their family back together. The decisions that they make to either work with the government or sympathize with the resistance thrusts an interesting dynamic into the family for Katie, Will, and Bram (their teenage son) as they deal with the allegiances they are faced with – adhere to rules established by the occupancy or sympathize with the resistance. Both Will and Katie are forced into arrangements that they do not want to be in and while not giving too much away they end up on opposite sides. To make things worse they do not share much with each other so there is a degree of concealment to which each must commit. Katie takes on more of the burden, because she is helping out her sister as well so she is forced into some interesting situations. The occupying force is really made up of human collaborators, who are the ones running the newly established government and they are backed up by roving alien drones. The new government is not a gentle one either and there are some tough rules that everyone must adhere to. There is, for example, a curfew and if anyone says or do anything out of line they are taken away and never seen again. Hardline physical punishment is not uncommon if anyone says something out of line or stands in the way of the police. Furthermore, not only do to they go after the rule breaker they go after their family as well. You can understand that folks living in this situation are scared to look the wrong way sometimes. There is a political and social class dynamic to this show which is starting to evolve so this is also interesting to see what the writers do with it. The casting of Peter Jacobson (House M.D.) was a great move and he plays a very good sleazy self-serving political leader. This resistance is a shadowy organization and while there appears to be a leader there is a bit of mystery about him (or her). You do see propaganda on both sides in the form of posters supporting the resistance or promoting the government as well as underground radio transmissions from the resistance which must be listened to in secret. So far five episodes have aired and some of the ground work has been done to set the tone and begin framing out relationships. The portrayal of Katie stands out for me. This character is faced with so much trying to help her family. I find her acting genuine. There is not much backstory to the characters yet, which might happen over time, but most of the focus is on the here and now. The writers do a great job teasing some things about the occupying force and also about the resistance while not giving away everything and this encourages me to come back each week. And since they do not lay out all the cards on the table first there is depth to this show and many options for the writers to take as the show matures. The acting is what sets this one apart for me as this show is grounded in drama showing the emotions the family has to endure in complying with the rules set out by the occupancy and also hiding their sympathies toward the resistance. One thing I keep in mind while watching new shows is to see if I can predict the storyline, certain decisions, or actions. This show is not predictable nor is it procedural. There are a few on-going storylines so when you watch it from the beginning you will see connections to actions and decisions in prior episodes. Character development is good and I think the cast is doing a good job. I certainly enjoy watching this show and look forward to seeing what comes next. The good news is the show has been picked up for a second season. The question you must now ask yourself now is…. will you resist or will you collaborate?